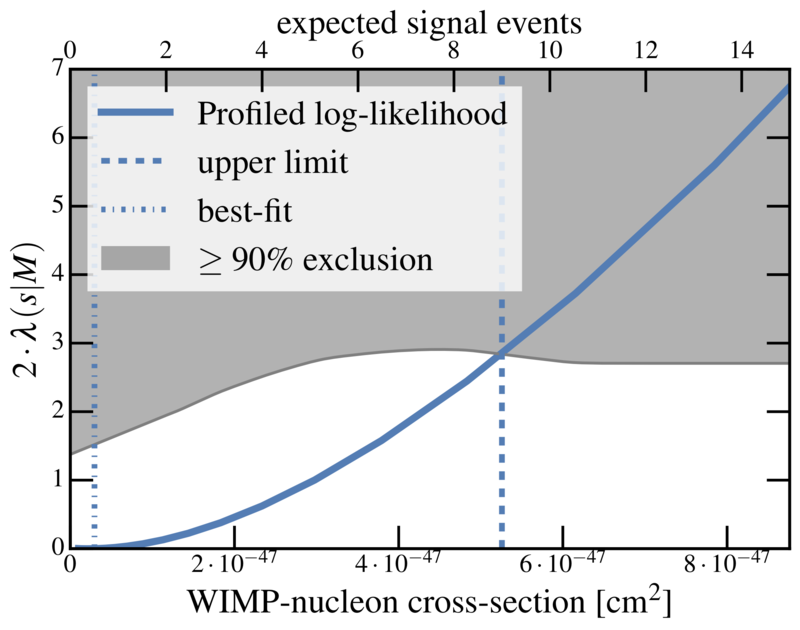 The spin-dependent WIMP-nucleon interaction contains a range of possible cases, so experiments typically consider two extreme ones: the case where WIMPs only scatter off protons, and the case where they only scatter off neutrons. Most of the spin in xenon is carried by neutrons, so xenon experiments are better at constraining the neutron-only case. These results set the most stringent limit on this case, using the same data and procedure as the spin-independent result. We also tried out a new method of combining our constraints with complementary searches at particle accelerators, following the example of PICO-60. An open-access pre-print version of the paper is available on the arXiv. 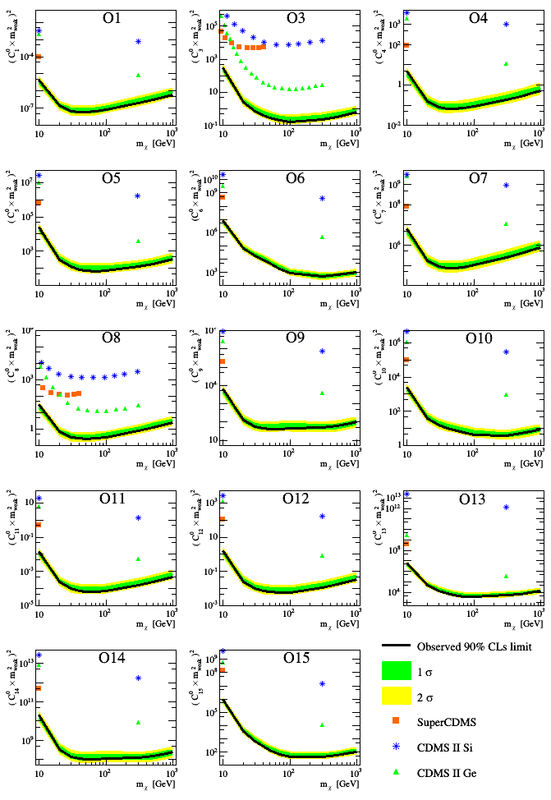 This entry was posted in Science and tagged 2019, analysis, dark matter, publications, results, science, spin-dependent, XENON1T on February 11, 2019 by Joseph Howlett. 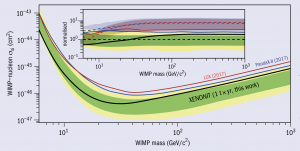 XENON1T results from a 1 ton-year dark matter exposure. 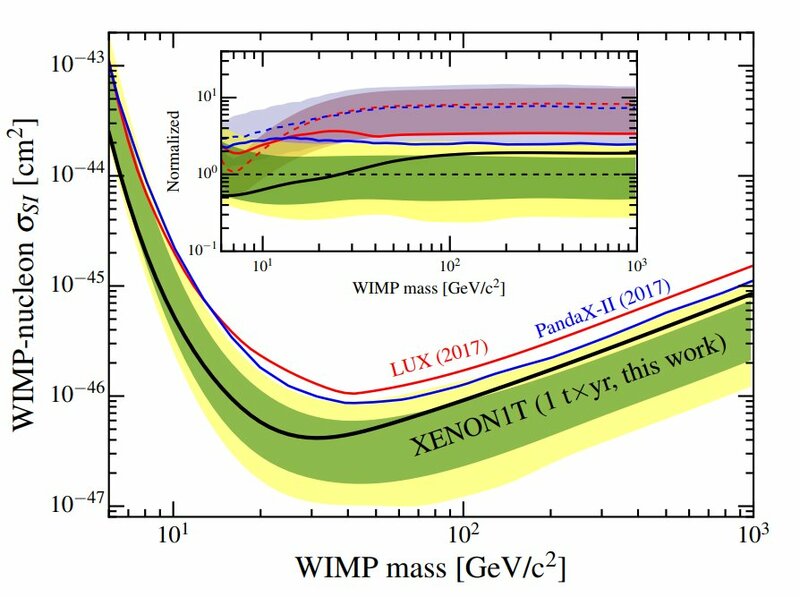 Our latest dark matter results from XENON1T, the most sensitive search for WIMPs with an unprecedented liquid xenon exposure of 1 ton-years and a world-record low background level is featured in the July/August 2018 edition of the CERN Courier, the International Journal of High-Energy Physics. Read the full article here. This entry was posted in Publications and tagged 2018, results, XENON1T on August 1, 2018 by Marc Schumann. The XXXIX International Conference on High Energy Physics (ICHEP2018) was taking place from July 4 – 11, 2018 in Seoul, Korea. After a warm welcome in this modern and traditional metropolis with over 10 million citizens, I was invited to present the recent results from XENON1T in a Dark Matter parallel session. Here is one slide of my talk visualizing the spatial distribution of the unblinded and de-salted events. Spatial distribution of unblinded and de-salted data. The left plot shows the X- and Y- distribution, while the right plot indicates the radius R versus depth Z for the same set of data. The enlarged fiducial volume of 1.3 tons with respect to the first result, is highlighted by the pink line. 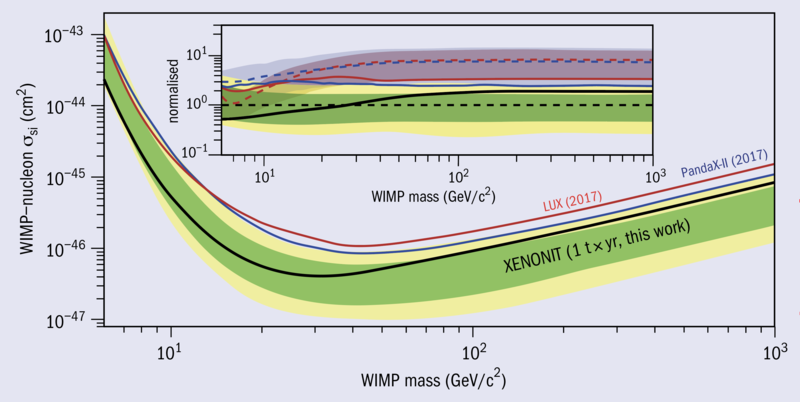 For the analysis, a core volume (green line) was defined to distinguish WIMP-like events over neutron-like background events. The different events are visualized by pie charts, where the color code resembles the relative probability from each background component assigned by the best-fit. The larger a pie is, the more “WIMPy” it is. As you can see, only a few “WIMPy” events were found that are comparable to the background model expectations. 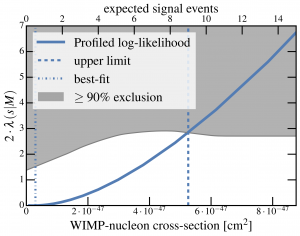 From this, we derived the most stringent limits on spin-independent WIMP-nucleon cross sections. At the end of my talk, I also reported on the status of XENONnT, which will feature a 10x higher sensitivity than XENON1T. One main task is radon mitigation, one of the dominant backgrounds, which is visualized in this slide. In a first step, a careful material selection needs to be made to avoid radon emanation from the start. Then, a new high throughput radon distillation column is under development to further reduce the radon contribution. 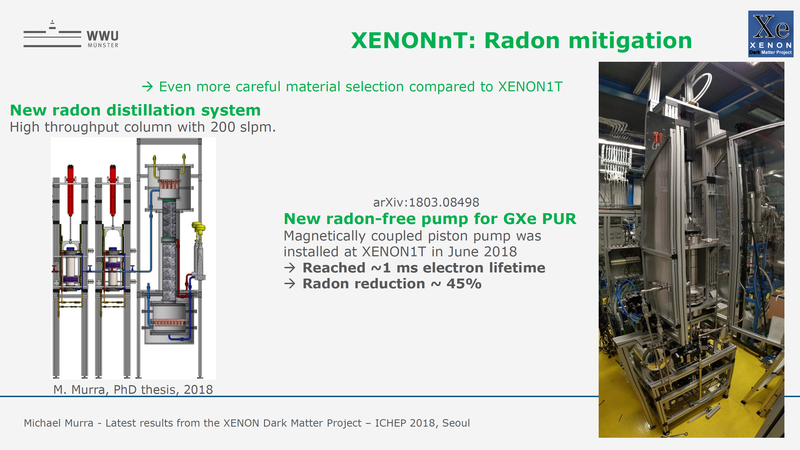 Additionally, a new custom-made radon-free magnetically-coupled piston pump was built and installed at XENON1T in June 2018. With that, the radon budget in XENON1T was reduced by almost half (45%), which is an important step for the future XENONnT experiment. The full talk is publicly available here. 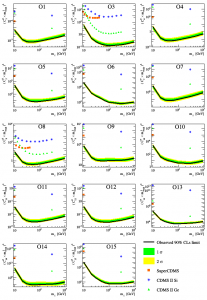 This entry was posted in Talks and tagged 2018, analysis, dark matter, publications, results, talk, XENON1T, XENONnT on July 18, 2018 by Michael Murra. 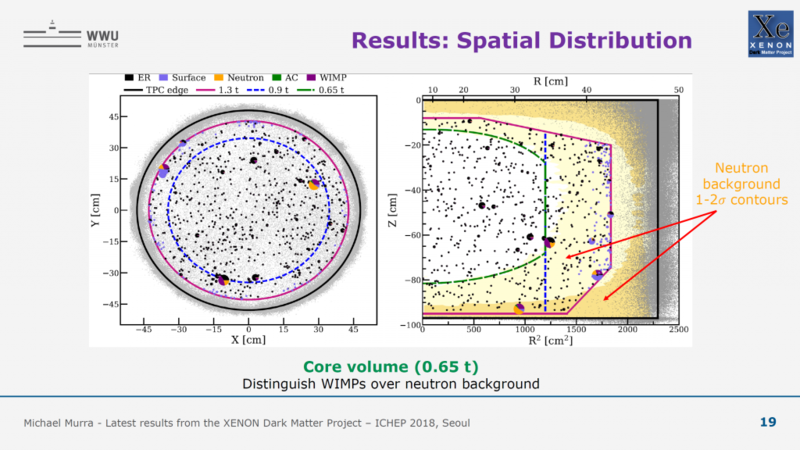 Results from XENON1T, the world’s largest and most sensitive detector dedicated to a direct search for Dark Matter in the form of Weakly Interacting Massive Particles (WIMPs), are reported today (Monday, 28th May) by the spokesperson, Prof. Elena Aprile of Columbia University, in a seminar at the hosting laboratory, the INFN Laboratori Nazionali del Gran Sasso (LNGS), in Italy. The international collaboration of more than 165 researchers from 27 institutions, has successfully operated XENON1T, collecting an unprecedentedly large exposure of about 1 tonne x year with a 3D imaging liquid xenon time projection chamber. The data are consistent with the expectation from background, and place the most stringent limit on spin-independent interactions of WIMPs with ordinary matter for a WIMP mass higher than 6 GeV/c². 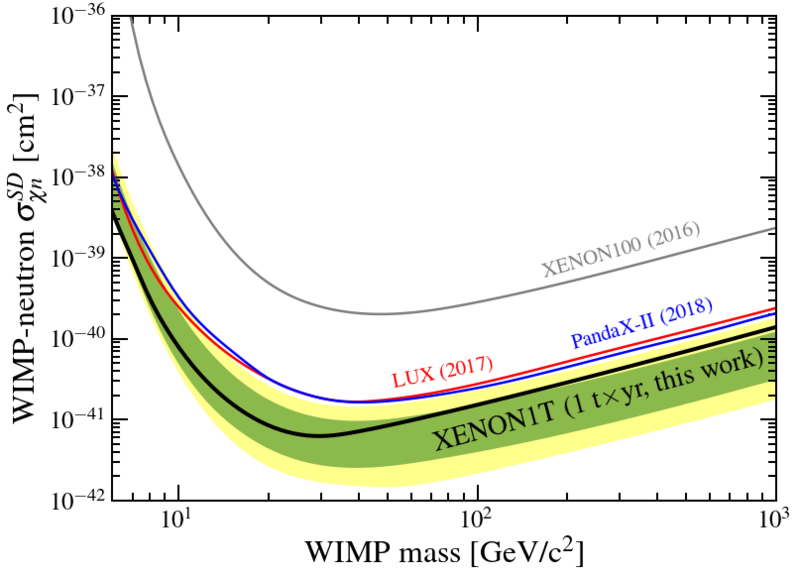 The sensitivity achieved with XENON1T is almost four orders of magnitude better than that of XENON10, the first detector of the XENON Dark Matter project, which has been hosted at LNGS since 2005. 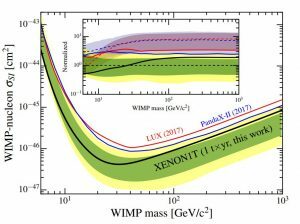 Steadily increasing the fiducial target mass from the initial 5 kg to the current 1300 kg, while simultaneously decreasing the background rate by a factor 5000, the XENON collaboration has continued to be at the forefront of Dark Matter direct detection, probing deeper into the WIMP parameter space. Shown are the limits on WIMP interactions, derived from one year of XENON1T data. The inset compares our limit and sensitivity with the limit and sensitivities of previous experiments. WIMPs are a class of Dark Matter candidates which are being frantically searched with experiments at the Large Hadron Collider, in space, and on Earth. Even though about a billion WIMPs are expected to cross a surface of one square meter per second on Earth, they are extremely difficult to detect. Results from XENON1T show that WIMPs, if they indeed comprise the Dark Matter in our galaxy, will result in a rare signal, so rare that even the largest detector built so far can not see it directly. XENON1T is a cylindrical detector of approximately one meter height and diameter, filled with liquid xenon at -95°C, with a density three times that of water. In XENON1T, the signature of a WIMP interaction with xenon atoms is a tiny flash of scintillation light and a handful of ionization electrons, which themselves are turned into flashes of light. Both light signals are simultaneously recorded with ultra-sensitive photodetectors, giving the energy and 3D spatial information on an event-by-event basis. In developing this unique type of detector to search for a rare WIMP signal, many challenges had to be overcome; first and foremost the reduction of the overwhelmingly large background from many sources, from radioactivity to cosmic rays. 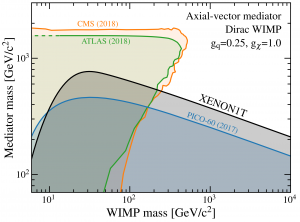 Today, XENON1T is the largest Dark Matter experiment with the lowest background ever measured, counting a mere 630 events in one year and one tonne of xenon in the energy region of interest for a WIMP search. 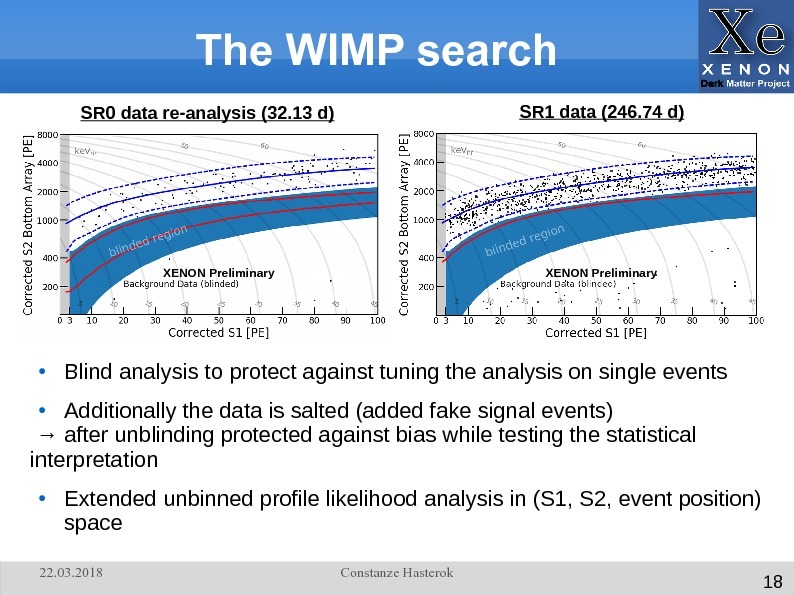 The search results, submitted to Physical Review Letters, are based on 1300 kg out of the total 2000 kg active xenon target and 279 days of data, making it the first WIMP search with a noble liquid target exposure of 1.0 tonne x year. 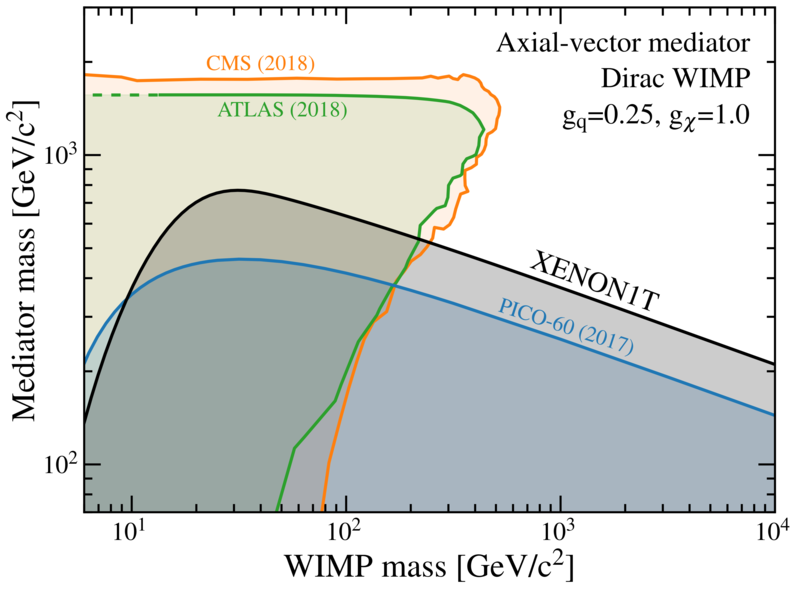 Only two background events were expected in the innermost, cleanest region of the detector, but none were detected, setting the most stringent limit on WIMPs with masses above 6 GeV/c² to date. XENON1T continues to acquire high quality data and the search will continue until it will be upgraded with a larger mass detector, being developed by the collaboration. 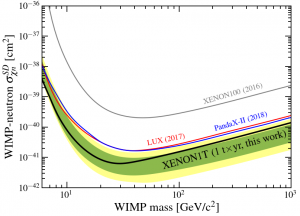 With another factor of four increase in fiducial target mass, and ten times less background rate, XENONnT will be ready in 2019 for a new exploration of particle Dark Matter at a level of sensitivity nobody imagined when the project started in 2002. 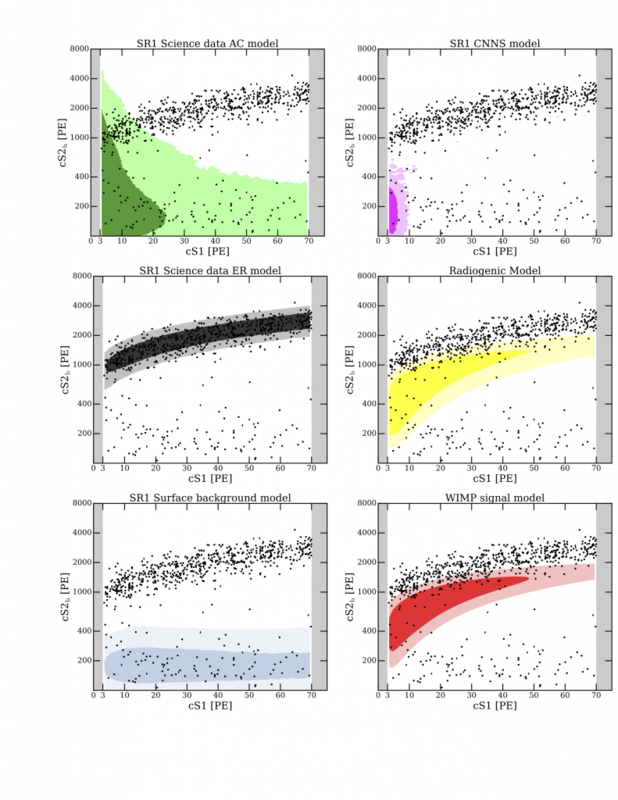 This entry was posted in Science and tagged 2018, analysis, dark matter, results, XENON1T on May 28, 2018 by Rafael Lang. The spring meeting of the german physics society took place from 19th to 23rd March in Würzburg, a very historic city with its baroque Residence from 1744 that belongs to the UNESCO world heritage. 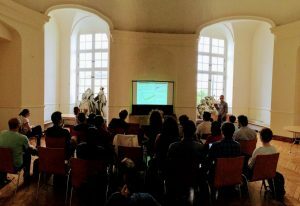 The meeting is a yearly get-together of physicists working in german institutions and provides the opportunity to exchange and learn about new projects and results within the particle physics community. The conference program can be found here. For comparison, the data from the first science run (SR0) that was ended by an earthquake is shown in the left figure. Already with SR0 which was a factor of 8 shorter than SR1 we could set the most stringent limit on spin-independent WIMP-nucleon cross-sections and prove a detector background level that makes XENON1T the most sensitive experiment worldwide. Hence, we are eager to unblind the signal region (marked by the blue band) in the new data set after some final checks of the analysis and find out if we actually measured a few WIMP events. We would be able to see a 3 sigma excess of a signal with a cross section just below the upper limit of SR0 with more than 50% probability. So maybe the discovery of dark matter is just around the corner? This entry was posted in Talks and tagged 2018, analysis, dark matter, results, talk, XENON1T on April 20, 2018 by Constanze Hasterok. 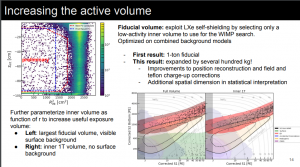 Here we discuss how we were able to increase the amount of liquid xenon we use for our dark matter search from ~1000kg to ~1300kg. The top left plot shows an example larger search volume (red) compared to the smaller volume used for the first result. But it’s not so simple as just adding volume. While our inner detector is completely free of WIMP-like background, the outer radii contain background components that can mimic WIMPs. This is illustrated in the bottom right plot where the background-free inner volume (right) is contrasted with the full search volume containing the outer radial sections (left). The full volume has a contribution from PTFE (Teflon) surface background (green contour and points) that is absent as soon as we consider only the inner volume. Our statistical interpretation has been updated so it is smart enough to take this into account. We parameterize our entire search region in both radial and spatial dimensions with expected signal and background distributions described at each location. This allows us to fully exploit the sensitivity of our innermost background-free volumes while also gaining a modest improvement from the outermost ones. This entry was posted in Talks and tagged 2018, analysis, background, dark matter, results, talk, XENON1T on March 22, 2018 by Daniel Coderre. Modulation results from Xenon100 presented at PASCOS 2017 conference. 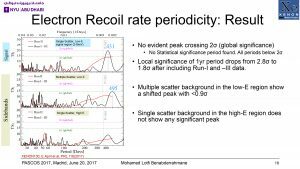 On Tuesday 20th of June, we presented our latest results on Electronic Recoil Modulations with 4 years of Xenon100 data at the PASCOS 2017 conference held in Madrid. After a short introduction, by M.L. Benabderrahmane, to the dark matter modulation as a signal, the main results have been presented, namely the test statistics of unbinned profile likelihood to search for the modulation period using three different sets of data. The first set contains the single scatter events in the energy range 2-5.8keV, the second set contains Multiple scatter events in the same energy range and the last one contains single scatters in the energy range 6-20keV. The last two samples are used as a sideband. The results of the likelihood gives a period of 431 days which is different from the one observed by the DAMA/LIBRA collaboration. Our single scatter modulation at 431 days has a global significance below 2sigma. The local test statistics for one year period gives a 1.8sigma. Similarity of the spectra between the two control samples and the signal sample disfavors the possibility for a modulation due to Dark Matter interaction. 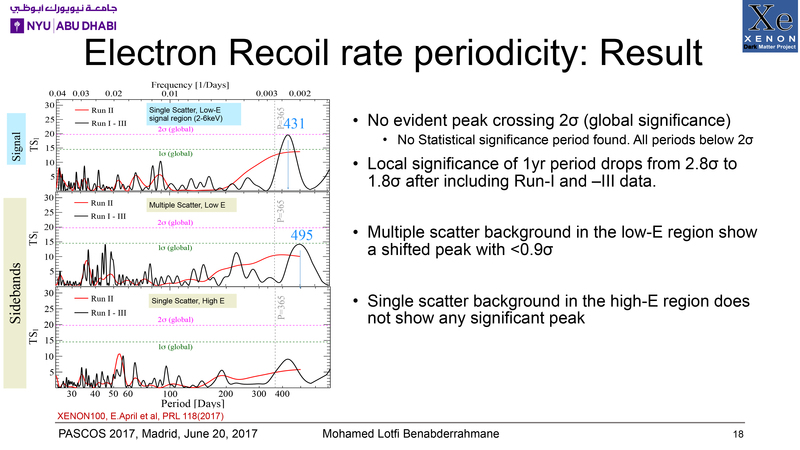 This entry was posted in Talks and tagged 2017, analysis, electronic recoil, modulation, results, talk, XENON100 on June 23, 2017 by Lotfi Benabderrahmane. The traditional approach for WIMP nucleus interaction studies in direct detection experiment is to consider just two types of interactions, the spin independent (SI) and the spin dependent (SD) ones. However, these are not the only types of interactions possible. In recent years, a non-relativistic effective field theory approach has been studied. In this framework, 14 new interaction operators arise. These operators include the SI and SD ones among others. Some of these new operators are momentum dependent and predict a non-exponential event rate as function of energy, in contrast to the traditional expected signals. Moreover, some of these operators predict energy recoils above the upper threshold of the standard analyses done in direct detection experiments. For XENON100, this threshold is 43keV (nuclear recoil). In this analysis, we extend the upper energy threshold up to ~240 keV. This value is dictated by low statistics in calibration data above it. We divide our signal region into two regimes, low recoil energy, on which we perform the same “standard” analysis done for the SI and SD cases, and high recoil energy, which is the main focus of this work. Summary of regions of interest, backgrounds, and observed data. ER calibration data, namely 60Co and 232Th data, is shown as light cyan dots. NR calibration data (241AmBe) is shown as light red dots. Dark matter search data is shown as black dots. The red line is the threshold between the low and high energy channels. The lines in blue are the bands. For the low energy channel these are operator and mass dependent, but are shown here for a 50 GeV/c^2 WIMP using the O1 operator. For the high-energy region, the nine analysis bins are presented also in blue lines. We find that our data is compatible with background expectations. Using a binned profile likelihood, we thus produce 90% CL exclusion limits for both elastic scattering and inelastic WIMP scattering for each operator. Find the preprint of this study on the arxiv. limits are indicated in solid black. The expected sensitivity is shown in green and yellow (1σ and 2σ respectively). Limits from CDMS-II Si, CDMS-II Ge, and SuperCDMS  are presented as blue asterisks, green triangles, and orange rectangles, respectively. The first results from the XENON1T experiment were presented at the 29th Rencontres de Blois by Dr. Alexander Kish, researcher from the University of Zurich. The slides from the well-received presentation which highlighted the conference can be found here. This entry was posted in Talks and tagged results, science, talk, XENON1T on June 12, 2017 by Alex Kish.